Capacity: 225 BallsIdeal for traveling teaching pros! Ready to use, no assembly required. Collapsible button-locking legs make it easy to transport. Racquets can be locked inside cart (handles fit through corner openings). Includes easy-locking lid, durable 4 inch wheels.Note: The lower shelf, Part 3129, is not included and is sold separately. Ideal for traveling teaching pros! 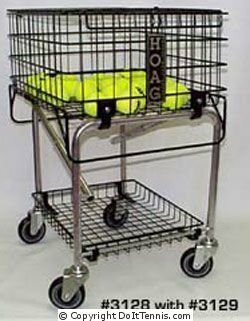 Racquets can be locked inside cart (handles fit through corner openings).